I like to say there are three categories in the craft business: Do it Yourself, Do it With Me and Do It For Me In the early 80’s I was in the "Do it For Me" Business. Id' say "architect" when asked what I wanted to be when I grew up. The next best thing when you're 9 is assembling dollhouses. There weren’t many open-ended or even guided craft experiences for kids, nothing like the selections in the market today. Ma and Pa hobby shops sold dollhouses for girls, and model car and truck sets for boys, oh and latch hook kits, that was pretty much it. I couldn’t get enough of this DIY stuff, as many dollhouses, model car sets and latch hook kits as my mother would buy, I’d assemble. Mom told me she refused to allow me to be bored as a kid, I was always crafting, assembling and making. My tagline was “Great Gift for all Ages! Years of Enjoyment! What kid thinks about this kind of stuff??? Who was I?? "Fully assembled and furnished for 53.00 USD." The lead time was two weeks. My factory was in my bedroom. I apparently controlled costs by limiting the choice of paint color. 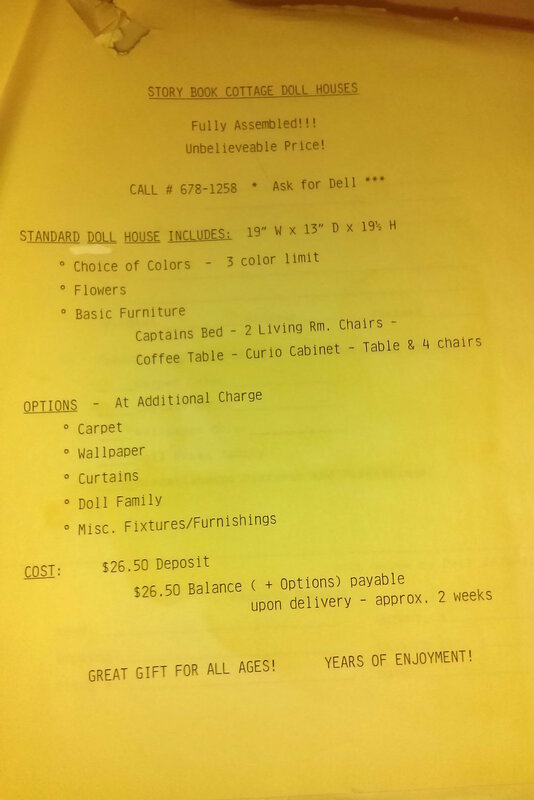 😭 Customers could order a fully customized dollhouse, complete with flowers, a captains’ bed, 2 lounge chairs, coffee table, curio cabinets, table and 4 chairs. My Sell Sheet - Mom never throws anything away so I have the receipts. I designed (typed) my own sell sheet, samples, pricing list and order form (with up-sell options). My customers could order the ultimate in luxury options, they could select house, trim and shingle paint color. For an additional charge - they could have carpet, curtains, wallpaper, an entire dollhouse family, and whatever "miscellaneous fixtures and furnishings" were. If you wanted to place an order, you filled out the form, called me on the house phone, and paid a deposit. My receipt was on the sell sheet. I loved miniatures, and almost 15 years later, I had the opportunity to think in miniature once again as designer and developer for Stickopotamus and later on, Jolee’s sticker line, the first three-dimensional sticker (which rose sticker price points from .99 upwards to 4.99). Thinking in miniature was THE perfect creative process prep for illustration for sticker design. My love of small tiny things was the impetus behind the endless options and line extensions for those enormously successful brands. The DIY in-a-box assembly aspect helped me in my role as VP for the Creativity for Kids brand. Greenleaf Dollhouse influenced many of the creative things loved and created as a product designer. Today you are able to purchase this exact Dollhouse Kit online from $33.00 to $200.00.